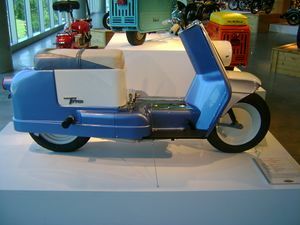 Introduced in 1960, the Topper was Harley-Davidson's answer to compete with the predicted scooter boom. The Harley Davidson Topper was a fiberglass motor scooter, was introduced. Harley-Davidson acquired Italian manufacturer AeronauticaMacchi S.P.A. to produce a line of smaller bikes including the Shortster and Sprint models. Italian-built lightweights were sold in America under the Harley-Davidson name. 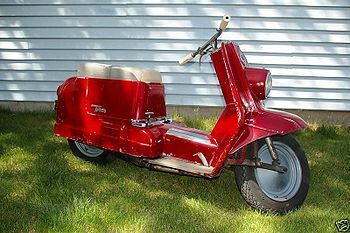 The Topper had some good features, such as the large diameter wheels and an automatics transmission, but never gained the popularity of the Italian Vespa or Lambretta machines. Scooter sales never took as every one expected, so total production of Toppers over a four year period was less than 3,800 units. Available options were a utility box for light deliveries and a single seat sidecar. The Topper featured a pull-cord starting mechanism much like that of a lawn-mower and a two-stroke engine. It has the same speedo and hand-brake lever as its big brothers, but that's about where the similarities end. From 1960 until 1965, Harley-Davidson built Topper Motor Scooters, and it was the only scooter platform that The Motor Company ever produced. The exact total of production numbers have been lost to history, but are estimated to be somewhere between a low of 3,500 to a high of 8,000 for all the model years combined. There are probably less than 100 of them in running condition today, making them extremely rare. The Topper was manufactured by the Harley-Davison Motor Company for only five years before it was permanently retired from their line. Because of its very low sales over its 5 year production period the Topper is a rare scooter. This page was last edited on 20 January 2011, at 22:59.